Little did I know that by walking through Denver’s City Park and its accompanying neighborhood I would learn about slave cargo, Shakespeare’s elm and Denver Squares. 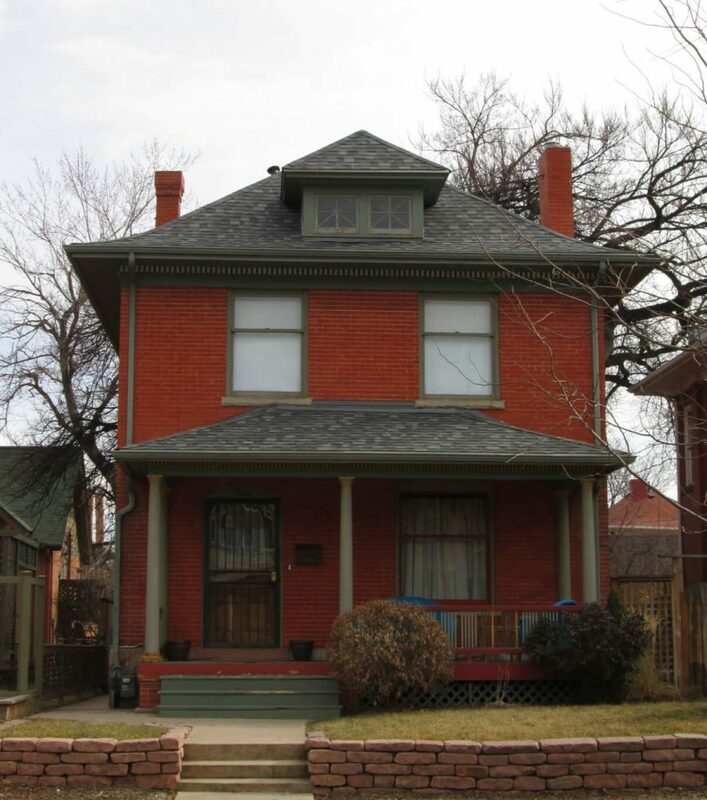 Yet this week’s Denver neighborhood walk, a 2.8 mile amble, uncovered amazing tidbits that fascinated all of us. Come along as we urban hiked through City Park and its neighborhood to the south. 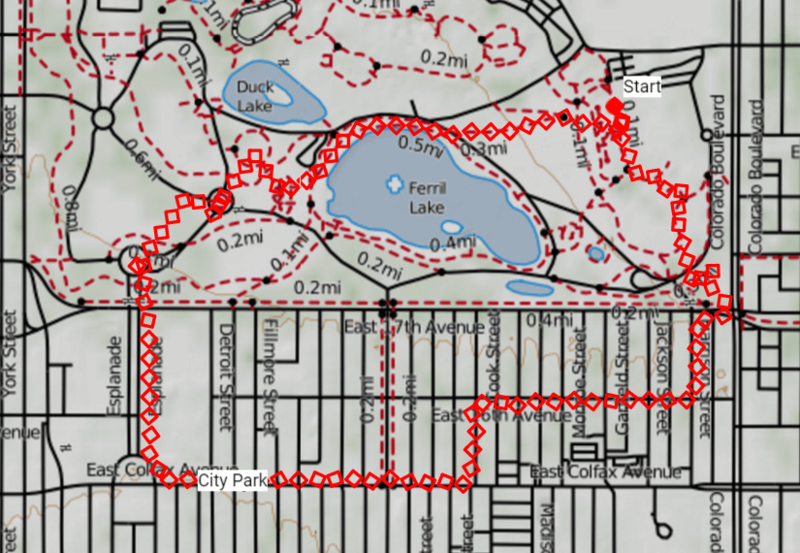 The official City Park boundaries are rectangular, made up of E 23rd Ave to Colfax, York to Colorado. Walking in City Park requires a stop at the top of the stairs just to the north of the Museum of Nature and Science to get what is arguably the best view of Denver, including Ferril Lake, the boat pavilion, the city skyline and the Rockies. In the summer at night, you can also add in the Prismatic water fountain of rainbow colors. Be sure to give thanks to the lake’s namesake, Thomas Hornsby Ferril. Denver’s poet laureate penned a wonderful poem about the lake called “This Lake Is Mine.” From there, an amble through the park passes you by many of the sculptures and gardens of City Park. Before heading into the park though, be sure to stop at the information boards at the boat pavilion which give an overview of each feature of the park. Take a picture of the overview sign so you have it with you as you adventure along. We stopped through Sopris Gardens and then headed to the Martin Luther King, Jr statue. It is the best ode to MLK I’ve ever seen, including statues of Ghandi, Sojourner Truth, Rosa Parks and Frederick Douglass. Be sure to take at least 20 minutes here to read the quotes and interact with the interpretative board to the west of the statues. Don’t miss the inlaid sculpture displaying the diagram of how slaves were ported in cargo ships on their way to America. It’s heart-stopping. 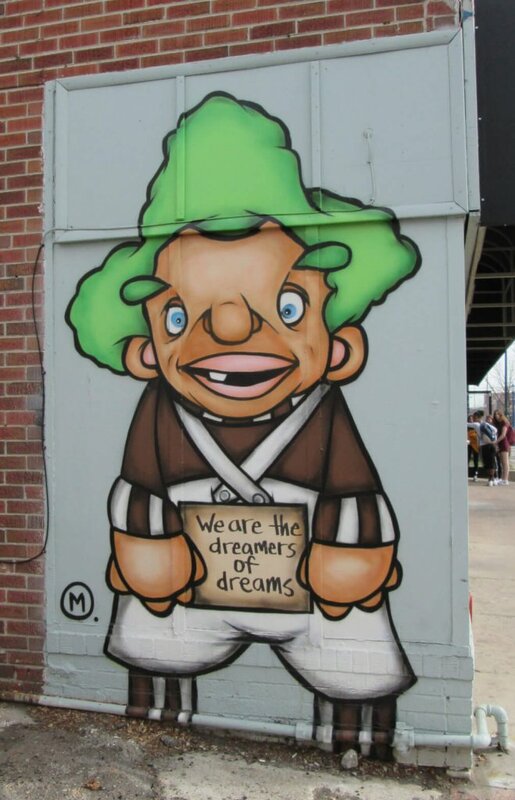 Once you’ve had your fill of City Park’s treats, head down the east promenade entrance toward East High School, Denver’s first high school. Neal Cassady, among many other famous Denverites, went to school at East. Notice the great entrance gate to the park and its ode to mining and agriculture. Walking along Colfax can overwhelm the senses. Known as the longest, continuous, urban street in the US, this busy center of town invites a curious and adventurous mind. Hardly can you find a big box store or large corporate entity, Colfax exists mostly due to its small, independent store fronts, bars, and restaurants. Be sure to stop by the Bluebird Theatre to check out its 1913 architecture. You’ll want to head into the actual City Park neighborhood, particularly along Cook Street and onto E 16th Avenue. Rich along these few blocks are great examples of Denver Squares. These functional home types popped up after the silver bust. You’ll find several examples of Squares in this neighborhood, and as you work your way east, you’ll also be able to contrast them with bungalows. As you make your way back to the park, be sure to stop at the corner of 17th and Colorado. 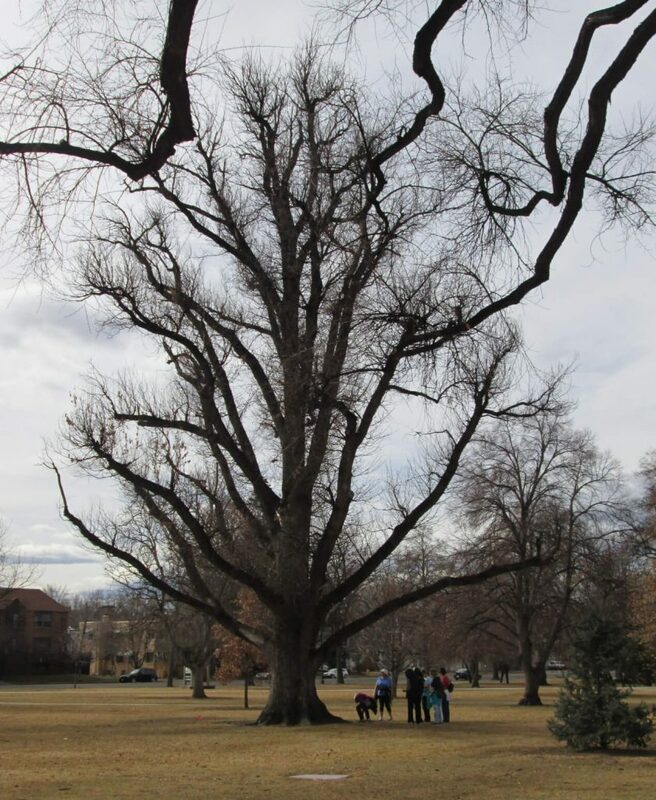 Look for a giant elm tree. Known as Shakespeare’s Elm, the original switch that grew the tree came from Shakespeare’s grave at Stratford-on-Avon. When you see the elm, find the plaque at the trunk identifying this 1916 beauty. Start at the snowy mastodon at the NW corner of the parking lot at Denver Museum of Nature and Science, 2001 Colorado Blvd, Denver, CO 80205. Head west to the top of the stairs looking west, catching the best view of downtown and the Rockies. Go down the stairs past the rose gardens and toward the lake. You may stay on paths or walk on the grass as you approach the lake. Once you get to the lake, head northwesterly along the path toward the boat pavilion. At the pavilion, be sure to read the signage about the different landmarks and sculptures in the park. Take a picture of the sign so you can reference it while walking. Head north around the pavilion to the Sopris Gardens, paying attention to the two sun dials. Head southwesterly toward the large statue plaza. 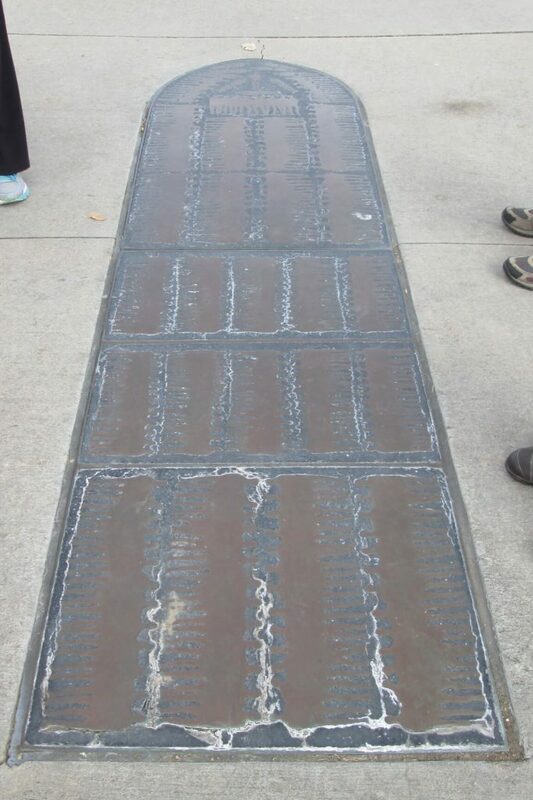 Admire Martin Luther King, Jr, and the other statues, then be sure to walk just to the southwest of the statue to see the slave ship and interact with the interpretive board. 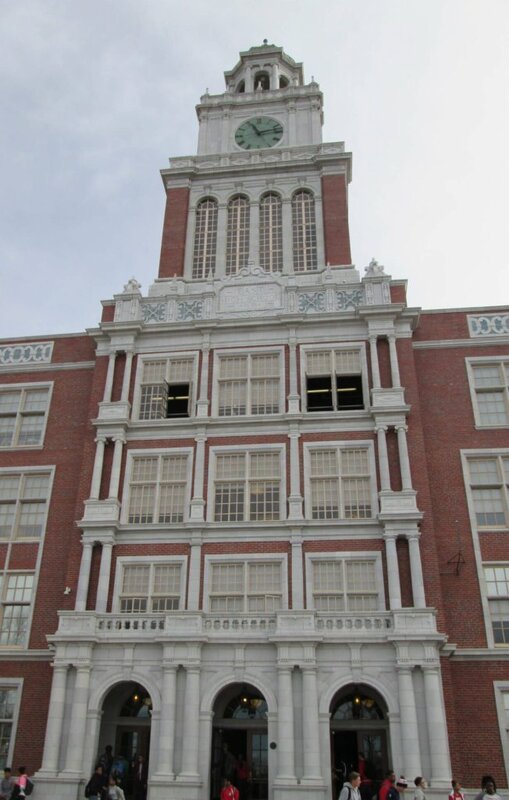 Head north then west toward the east promenade, crossing 14th, as you head south in front of East High School. Admire the statues of agriculture and mining at the entrance to the park, then head east on Colfax. Walk along Colfax noticing the variety of shops, artwork, and people along the way. Make your way to the Bluebird. Right before arriving, see if you can notice the artwork painted right onto the street in the intersections. At Cook Street take a left. You’ll start to see the Denver Squares mentioned above. At E 16th Ave, take a right and continue your amble through the neighborhood comparing Squares to Bungalows. At Harrison Street take a left, then at 14th take a right. Make your way to the crosswalks at 14th and Colorado, crossing 14th to the north. Once across the street and back in the park, look to your NW. You’ll see a large elm. Make your way to its trunk and notice the signage for the Shakespeare Elm. Make your way north back toward the museum. Walk to the west side of the museum, past the totem pole, the bear, and then back to the snowy mastodon, completing your 2.8 mile urban hike through City Park.